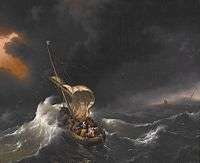 The Storm on the Sea of Galilee by Rembrandt, 1632. 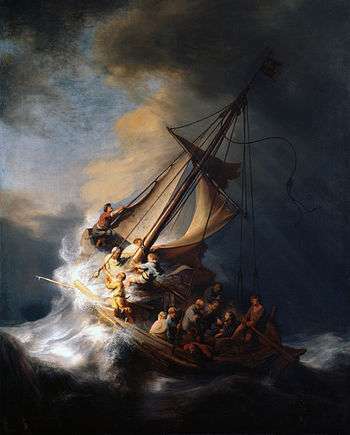 Calming the storm is one of the miracles of Jesus in the Gospels, namely in Matthew 8:23-27, Mark 4:35-41, and Luke 8:22-25. 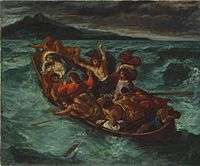 This episode is distinct from Jesus' walk on water which also involves a boat on the lake and appears later in the narrative, in chapter 14 of Matthew. He got up, rebuked the wind and said to the waves, "Quiet! Be still!" Then the wind died down and it was completely calm. He said to his disciples, "Why are you so afraid? Do you still have no faith?" They were terrified and asked each other, "Who is this? Even the wind and the waves obey him!" Author Michael Keene commented that the Sea of Galilee was known for its sudden and fierce storms and that the Jews were people of the land who were generally uncomfortable at sea, specially since they believed the sea to be full of frightening creatures. The Pulpit Commentary attributes these sudden storms to winds arising on the summits of Mount Hermon, in the Anti-Lebanon mountains to the north. 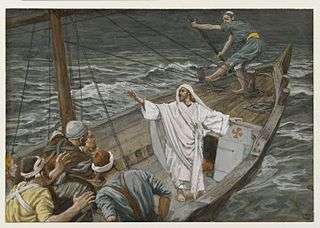 The disciples were probably in a small, open fishing boat when they encountered this great storm. The original Greek word for the storm is “seismos” which literally means “a shaking” and is the term we use to get the word seismic which is descriptive of earthquakes. The violence of the storm shook the water in the lake creating waves that covered the boat and started filling it with water. ↑ McArthur, Dr. John (1987). Matthew 8-15 MacArthur New Testament Commentary. The Moody Bible Institute of Chicago. p. 33. ISBN 0-8024-0763-3.